Today I got a cute little package full of nail goodies sent to me for review courtesy of the Born Pretty Store. The Born Pretty Store is located in China. They have a huuuuuge variety of nail and beauty accessories that are very affordable. Granted, coming from China they need 2-3 weeks to get to the states but for the price, I don't mind waiting. 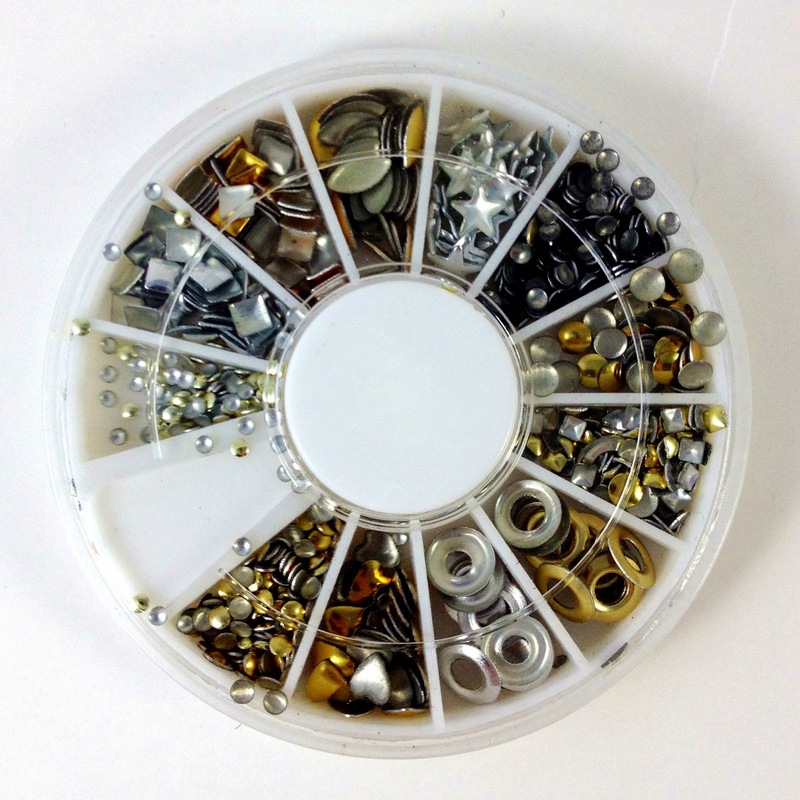 The first product is a stud wheel including different sizes and shapes in gold, silver and bronze. 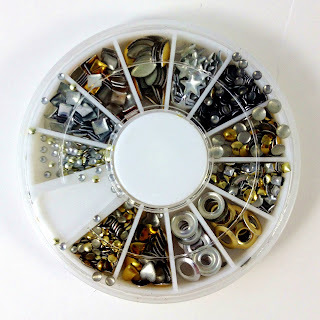 I always have such a hard time finding nice inexpensive studs so this is awesome! 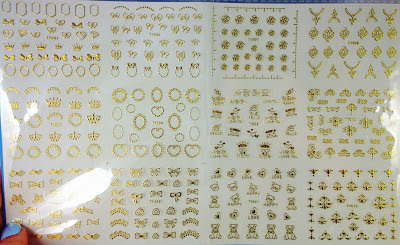 Serious...at Sallys they had an acrylic stud set like this for $14. This is just under $5! All the studs have concave backs to fit the curve of your nail better. The top coat suctions the stud in place. I rocked the smaller studs but there are a few larger studs that don't hug the nail as well as the smallers. Next up are the 12 Piece Gold 3D Stickers (click the picture to blow it up and see more detail). These are themed in each set with lots of fun designs. When I tried to take these off the paper I found they were very brittle and would easily crack apart and break if you didn't pull them off gently. Another issue I had with these was the gold coloration. When I applied a top coat over the sticker to seal it in, as per the directions, I got some gold bleeding that streaked down with the top coat. It isn't very noticeable but it can change the color of the polish underneath. The stickers also have a slight ridge that can be seen. For my mani I used Zoya Blu as the base which I received in my May Ipsy glam bag. I used the gold stickers on the pointer and ring finger. I went with all gold studs in small squares and circles and place a large heart on the ringer finger. Here is how I got this look! Overall I don't think I would buy the stickers again. I prefer hand painted art! The studs are definitely something I would like to continue purchasing in the future! I absolutely love my hardware. If there is any kind of nail accessory you can think of that you want for nails the Born Pretty Store has it! Use the code DLLW10 on the Born Pretty Store to get 10% off your entire order!